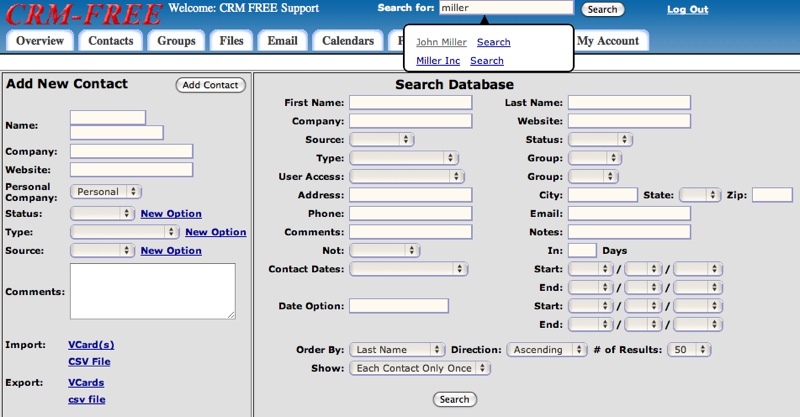 With CRM FREE you can quickly and easily add and search for all your contacts. Contacts and companies can be searched from the top of every page. As you type matching options will be displayed below and you can go directly to their record. By clicking on the Contacts tab you can quickly add a new contact or company, or search those already entered. You can search by name, address, phone, email, source, status, type, groups, when they were entered, accessed or updated, and any description of an important date such as birthday. Clicking on the groups tab you will see all your groups and the number of contacts assigned to each and quickly be able to view them.